Those screams you heard reverberating round the cosmos were not because I had been torturing the children again. In fact, it was the reaction of two small boys when I told them we had been sent the newly released Lego Harry Potter Years 5-7 video game to review. The inevitable follow up to the Lego Harry Potter Years 1-4 video game, the plot here follows the last three books of the Harry Potter series. So as you’d expect it’s darker in tone and content and leading up to a big battle with creepy noseless guy. Although there’s only so dark you can get when your characters only ever communicate in grunts and mumbles. It’s played for chuckles rather than frights. Knowing the plot of the last few Harry Potter books or films will help guide players through this game, though there are still plenty of puzzles to get stuck on. And you don’t need to have played the first Harry Potter video game, (but you’ll probably want to). And that was as much as I could get out of them before they dashed off to attempt another level. I am a big fan of the Lego video games. I’ve played most of them and haven’t found a bad one yet. Plus Harry Potter Years 5-7 features a broomstick flight across London – how cool is that? And if you want a real bargain check out the Lego Harry Potter app which gives you a version of the first video game for only £1.99. It’s rated as suitable for age 7+, meaning that there is some battling to be done, but it’s not an aggressively gory game at all. It’s more challenging to play than Disney Universe, and I doubt if many gamers younger than 7 could manage it. So the rating feels about right. This game will take persistence to play, but for those who do, the rewards are magic. 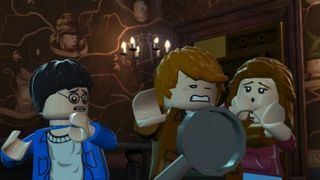 Lego Harry Potter Years 5-7 is out now for all major games formats. RRP from £24.99. We played the Wii version which is currently at £27.99 on Amazon.